Continuing in the camera obscura + lens metaphor of one’s vision and mind, the difference between a well composed shot from a ‘normal’ lens (one similar to human eye in relative proportion of foreground and background; neither compressing the distances as does telephoto, nor artificially distancing near and far as do wide angle lenses) comes to mind. 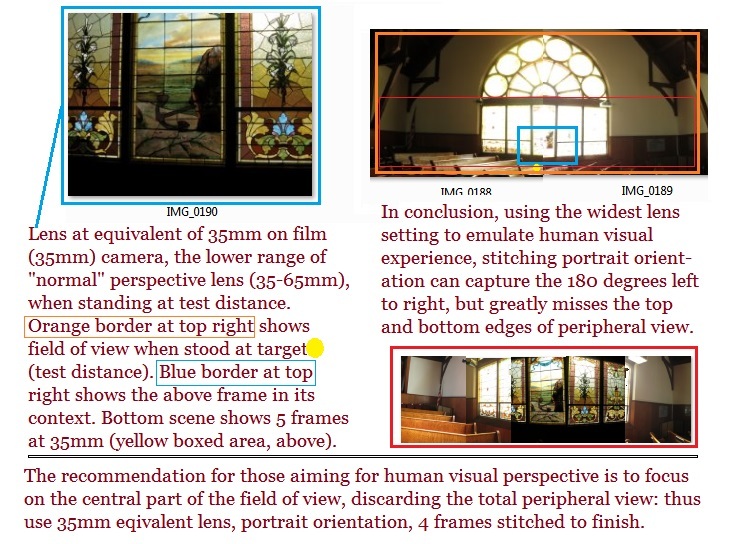 No matter if the aspect ratio is set to 16:9 (wide view), 3:2 (emulating the 35 mm film aspect ratio), 1:1 (square aspect), or the 4:3 aspect of TV, the angle of view is blinkered compared to the nearly 180 degrees of the natural human eye’s field of view. So while a well captured shot in any of these formats may be pleasing to the eye, it is necessarily partial and blind to the wider context (the photographer there at the scene may understand the conditions at the decisive moment, but viewers see only the post-production rendition). Here, then, are the merits of a panorama stitched from several overlapping images taken on a “normal lens” (equivalent in 35 mm film terms to a lens of 35 to 65 mm):  the normality of foreground to background proportions is maintained, but also  the wider context is recorded, too. Making the metaphoric extension, we can say that really knowing a place or time consists of a ‘normal’ perspective [the ‘normal’ lens, above], but comprises several views that are stitched to form a whole. By contrast the one-shot capture, even when made on a ‘normal’ lens is more like a spotlight than a full illumination of a scene; it shows just one, narrow view. Categories: heartware, Uncategorized | Tags: aspect ratio, camera obscura, decisive moment, panorama | Permalink.